Bactria is a historic region in Central Asia, along the Silk Road. At times it has been an independent kingdom, at others part of Alexander's Empire, the Persian Empire or Mongol Empire. Most of it was part of the Russian Empire and then the Soviet Union; today it is divided among Afghanistan, Tajikistan and Uzbekistan; part of Turkmenistan is close by to the west. Bactria lies on one of the main trade routes between Central Asia and South Asia; the Salang Pass pass goes south from Bactria to Kabul across the Hindu Kush mountain range, and from Kabul the Khyber Pass leads to Pakistan and India. The region is a crossroads and many ethnic groups are represented; the largest group are the Tajiks, and the main local language is the Tajik dialect of Persian. The map shows the region a few centuries BCE; at that time the Alexandrias were new but Bactres (now called Balkh) and Samarkand were already well-established cities. The borders have varied with the history, but the core of region is a roughly U-shaped area of fertile plains bounded by mountains on three sides; the main cities now are Dushanbe in the northeast and Mazar-e-Sharif in the southwest. The mouth of the U is on the west side; Merv and Herat are to the west and reachable across relatively flat country. Swinging north from the mouth, Bukhara and Samarkand can also be reached; historically the region around those cities was known as Sogdia, and was the northernmost province of the Persian Empire. A key geographic feature is the Amu Darya river, known in ancient times as the Oxus. It has been the northern border of Afghanistan since the days of the Great Game — the British and Russian Empires competing for influence in the region in the 19th century — and continues in the role today. The main Silk Road route east toward China goes from Samarkand through the Ferghana Valley (on the north edge of the map) via Khujand, Kokand and Ferghana, then over a pass to Kashgar. Khujand is shown on the map as Alexandria Eschate which translates as "furthest Alexandria"; Alexander founded the city to protect his northern border. Another route from Bactria to China, historically much less used, starts near Ai-Khanoum on the map, follows one of the river valleys up into the Pamirs and along the Wakhan Corridor toward China. The Corridor is the region around the river valley that goes off the eastern edge of the map roughly halfway up. Except for Dushanbe, which developed from village to city in the Soviet period, all of these cities have existed for at least a thousand years. In the late 19th century, Balkh was mostly abandoned due to an epidemic and Mazar-e-Sharif replaced it as the most important city of that area. Today, Mazar is still the main city and is the capital of Balkh Province; Balkh is now just a town with some fine old architecture. Kunduz and Sheberghan are also provincial capitals. Samarkand, one of the great Silk Road cities, was conquered by Alexander the Great in 329 BCE and reoccupied by king Eukratides in the early 2nd century BCE for a short period. The close Zeravshan Valley, known to the ancient Greeks as Polytimetus, features a defensive system of massive walls and iron gates that date back at the time of the Seleucide king Anthiocos I. The city shown on the map as Ai-Khanoum is now only ruins and is in Kunduz Province Afghanistan; it is thought to be Alexandria-on-the-Oxus, founded by Alexander the Great; that is not certain, but it was clearly a Greek city. Tilia Tepe is another important archeological site; the nearest modern town is Sheberghan. Balkh also has extensive ruins from the Greek period, plus many from later times. A large number of coins, including Greco-Bactrien tetra-drachmas portraying king Heliokles II, were found in 1946 at the site of Kisht Tepe, on the south bank of the Oxus River (Amu Daria) between Ai-Khanoum and Termez. All these places are in Afghanistan, so none are safe. Archaeological excavation and restoration were off to a good start some decades back, but they stopped as the country descended into war. If Afghanistan ever becomes peaceful enough that they can resume, these may become quite interesting places to visit. Civilisation in this area goes back a long way; excavations show a well-developed Bronze Age Oxus Civilization 2300-1700 BCE. The sites are referred to as the Bactria–Margiana Archaeological Complex. Margiana is an adjacent region to the west; the oasis of Merv is one of the main archaeological sites for this period in that area. The trade routes are also ancient; the Indus Valley Civilisation, centered in what is now Pakistan, had a trading outpost in Bactria by around 2000 BCE. Greek records mention trade with Bactria via a port called Barbarikon, near modern-day Karachi, several centuries BCE. 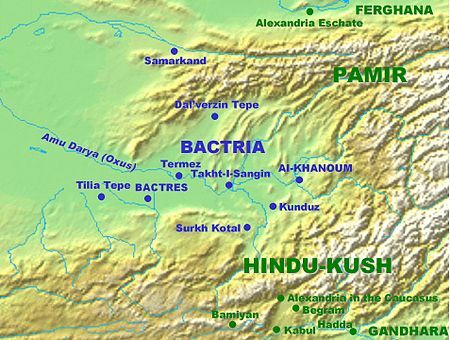 Bactria has been part of various empires and has been conquered many times — notably by Cyrus the Great and several later Persian rulers, by Alexander the Great, by Genghis Khan, and (most of it) by the Russian Empire. Alexander married a Bactrian noblewoman named Roxana, despite opposition from his advisers. At other times Bactria has been an independent kingdom or has ruled an Empire of its own; the first was the Greco-Bactrian Kingdom of Alexander's descendants (3rd and 2nd centuries BCE). Later the Kushan Empire (1st to 4th CE) and the empire of Timur the Lame or Tamerlane in the 14th century both started in Sogdia, a larger region that includes Bactria. Timur was born near Shakhrizabz, a bit south of Samarkand, and made Samarkand his capital. Armies have often followed the passes south. All three Sogdian empires mentioned conquered parts of what are now Afghanistan, Pakistan and India. Timur's descendants founded the Mughal Empire which ruled much of South Asia for centuries. More recently, Bactria has been the main base for two invasions of Afghanistan, by the Soviet Union in 1979 and by the US and its allies in 2001. Alexander built the city shown on the map as Alexandria in the Caucasus in a strategic position to control access to the passes; today nearby Bagram has one of the main US bases in Afghanistan. Much of the region was part of the Soviet Union and Russian is fairly widely spoken. The main local language is the Tajik dialect of Persian, and Afghanistan's Dari, which is another dialect of Persian, is also common. Afghanistan's other main language, Pashto, is also spoken. In the antiquity Greek was the dominant written language in the region during the Hellenistic Kingdom of Bactria. Aramaic was used by the earlier Persian empire as an administrative language. The Asoka edits in Kandahar were written in both Greek and Aramaic. The main methods of travel into the area are covered at Dushanbe#Get_in and Termez#Get_in. There are also Afghan highways which lead into the region, though they are still far too dangerous to consider as of late 2017. One goes from Kabul to Mazar-e-Sharif via the Salang Pass. Another runs from the country's westernmost major city, Herat. through Sheberghan to Mazar. Historically, camel and horse caravans were the main means of travel. These are still used, but now there are modern roads with trucks and buses plus some rail and air connections. The two-humped variety of camel used in many Silk Road caravans over the centuries are known as Bactrian camels. Their one-humped cousins are Arabian camels. There is a Bactrian Museum in Dushanbe. This is an almost entirely Muslim area, so drinking alcohol is generally frowned on. For the few exceptions, see the city articles. This is an area for cautious travel. The northern Bactrian areas of Afghanistan are perhaps not quite as dangerous as other parts of the country, but the warnings at Afghanistan#Stay_safe still apply. Across the border, the risks are lower but not zero; see Tajikistan#Stay_safe, Dushanbe#Stay_safe and Uzbekistan#Stay_safe. Going west from here to Bukhara or west-then-north to Samarkand is probably feasible, and would put you on the main Silk Road route. However, see our country guides for possible hazards and check government travel advisories as well. Going south would take you into Afghanistan and, as of late 2017, this is still strongly discouraged as too dangerous. Going north or east would take you into hill country, away from major transport routes and with some risk of banditry. It might make sense for experienced mountaineers with local guides, but almost certainly not for anyone else. Also, there was a serious outbreak of violence in the Pamirs, the area to the east of Bactria, in 2012; check current information before planning a trip there.